The dream of No Man’s Sky is an incredible thing: a procedural and simulated universe shared by everyone, unfettered by limitations. Everything’s big. Factions fighting for dominance in massive space battles, gargantuan worlds ruled by physics and the proximity to their suns, whole ecosystems playing out before our very eyes. Read more: float around in the black void until your heart’s content in the best PC space games. Lamentably, the reality is something entirely different. Those absurdly ambitious features exist only as shadows, stripped down to the bones when they do appear in the game at all. And the universe itself, exciting and enigmatic at first, threatens to become humdrum. It’s disappointing, then, but still capable of surprising you and, however briefly, washing away that disappointment. 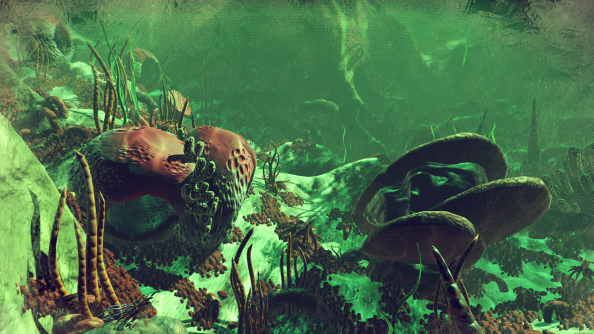 It is, I suppose, worth explaining what No Man’s Sky is not. It is not a simulation. It shares more similarities with Out There, an FTL-like space adventure originally published on mobile, than it does with Elite: Dangerous. And that’s fine; Out There is very good. 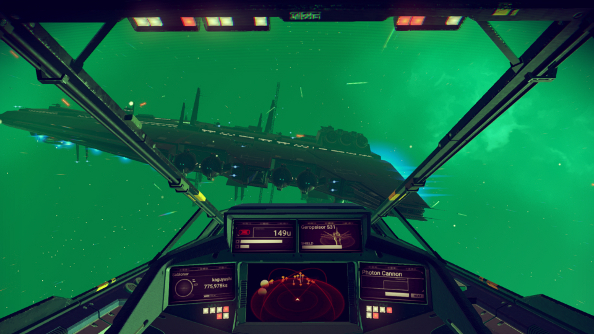 It’s a lot more punishing and tense than No Man’s Sky, however, which throws few serious challenges the player’s way. Indeed, the latter is positively leisurely: a serene journey through myriad pretty solar systems. You begin stranded on a random world, a barely functioning ship next to you and only the vaguest guidance. 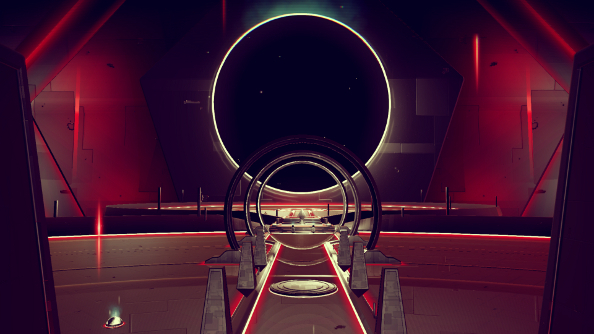 No Man’s Sky does an exceptionally poor job of pushing or even nudging players in the right direction, providing potential avenues of progression with less directness than a meandering, blind drunk. And even if you do manage to find yourself on the path, the game offers little in the way of purpose or direction. This absence of ‘hand-holding’ is bizarrely juxtaposed with the frequent and annoying pop-up tips that are rarely needed. I spent the better part of an evening trying to ignore the big blue box telling me how stamina worked – 15 hours into the game – despite having full stamina and being in a bloody spaceship, where it’s not even needed. Super helpful. Whether you’re on a quest to the centre of the galaxy or one of the other loosely defined goals, you’ll likely spend most of your time gathering resources on planets and moons. Why? Well, it’s something to do, isn’t it? There’s something horribly tragic about what the resource gathering and crafting system does to the game’s multitude of alien worlds, though. It makes exploring them perfunctory and formulaic. It transforms them into a long string of locales that exist to be pilfered, just so you can get to the next one and do exactly the same thing again. Gotta get more iron to recharge your shield. Gotta hunt down more zinc so you can fill up the hyperdrive. Gotta do this and that and none of it’s interesting and why oh why did you do this, Hello Games? No Man’s Sky doesn’t do anything with these systems. They just sit there, making you engage with this mundane busywork in a universe that you once, in your more naive moments, thought could have been full of wonder. Though maybe it’s still there, but just harder to see. I was speaking with a chum recently about No Man’s Sky. He likes it a lot. He has many good reasons for liking it this much, even though he’s wrong because we can’t both be right, right? He noted that he’d still enjoy it even if all the crafting and resource-gathering was ripped out of it. Hang on a moment, I thought, that would probably be a much better game. See, here’s the thing: it sits awkwardly between crafty-survival nonsense and a walking sim, but the former ultimately holds it back. What are the best bits? The bits where you’re simply exploring at your own pace, almost – but not quite – justifying the obtuse lack of direction. Example: I landed on a barren, purple world. 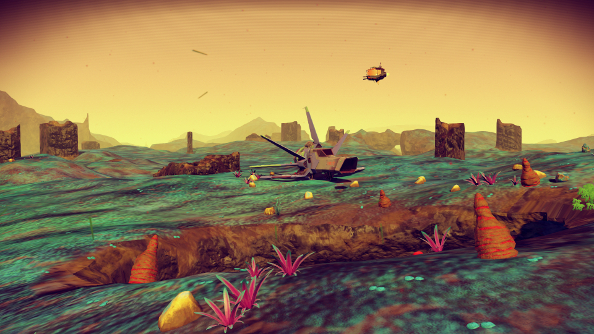 I don’t spend much time on boring planets, and even though this one had an unusual hue, it did look dreadfully dull. I needed a break from my quest to find the thing or speak to the orb or mull over some philosophical nonsense, however, so I decided to go on a wander. It was peaceful, but largely devoid of life. I admired a lovely cloud, and the sunset, and – in the real world – nibbled on a sandwich. And that’s when I came across the ominous red maw. Night on this world, this already dark and purple world, was serious business, so this gaping, glowing opening looked like a doorway to hell. With trepidation, I walked into it, expecting to be devoured by a huge, burrowing monster. Instead, I found a veritable Eden, a lively sanguine underworld full of flowers and vines and fluorescent rocks. It was gorgeous, and seemingly went on for miles in all directions. It was as if the world had been folded over, and all the life was hidden away beneath the surface. I didn’t find anything important in that place. No rare minerals or crates of sci-fi junk. Just beauty. That was more than enough. I left the cave more satisfied than I’d been in hours, simply pleased to have discovered and explored this unexpected paradise beneath a seemingly dead planet’s crust. Mining more carbon and platinum, filling up those stupid engines, topping up my bloody life support, I looked back on that discovery and wondered why I left. The game is full of those moments if you just take the time to ignore the more prosaic, mechanical elements. Even on worlds that look largely identical to a dozen other planets you’ve already visited – and there are plenty of them – there’s often something, even if it’s just a weird rock formation or a freaky looking school of alien fish, that promises to etch them into your memory. And, to a lesser degree, this is true in space as well. The void in No Man’s Sky is extraordinarily colourful, and some of my fondest memories of my stellar travels involve just sitting in my ship, engines powered down, floating in this kaleidoscopic, striking sea of nebulous clouds and distant worlds all vying for my attention. Screenshot Valhalla. As a piece of digital tourism, then, it is an impressive and a genuinely pleasant place to escape to when you’re craving some quiet solitude in a stunning environment. It’s only when the universe starts moving again that things start to fall apart. 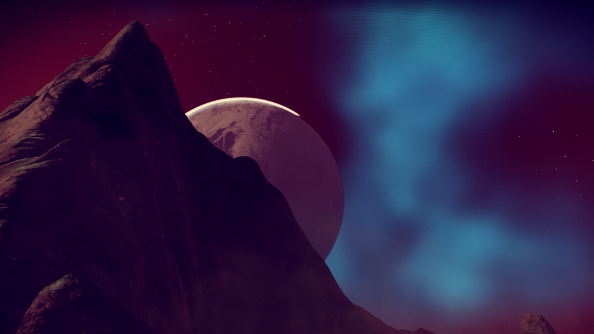 Whenever No Man’s Sky attempts to do something other than provide pretty vistas to stare at or explore at a leisurely place, it reveals itself to be a rather shallow experience. At the top of the unfortunately large pile of flaws is that it makes spaceships seem really, really boring. Spaceships! Even the word conjures up adventure and thrills. There are a plethora of vessels coming in all shapes and sizes, and they all might as well be the exact same ship, the only difference being how much cargo space they contain. A tiny fighter is just as good for a trader as a large hauler, and indeed might even have more storage capacity, because a ship’s size, like everything else to do with space faring vessels, is merely visual. They all handle like toys, coated in bubblewrap, safe and simple and light years away from thrilling. While sitting in the cockpit, I found myself desperately wishing I was back inside my complex Viper in Elite: Dangerous or some rickety, absurd and delightfully fun creation in Space Engineers. 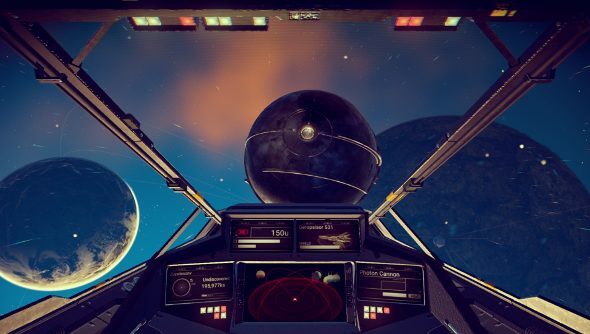 It boggles the mind that in a game which celebrates the wondrousness of space, flitting about the vacuum feels about as heart-pounding as nipping down to the shops in your 10-year-old Fiat. Looking past the spectacle of worlds rushing toward you and imposing monolithic space stations hanging above them, it’s bizarrely pedestrian. Each solar system feels more like an identikit model, contained and filled out with the same things: a few worlds and moons, identical space stations (Ok, the space stations get a pass, as they all seem to have been designed by Daft Punk and I’m completely fine with that. ), a few stationary freighters and the threat – but not really – of half-arsed pirate attacks. Oh combat, what a hassle. Aside from the occasional upgrade that puts an interesting spin on a weapon, like making laser bolts ricochet, fighting is a mind-numbingly simple point-and-shoot affair where you’ll face the same mentally subnormal foes over and over again. It feels like an afterthought, something used to plug a gap, and after only a few hours I looked at battles as a nuisance, getting in the way of my lightweight adventure. 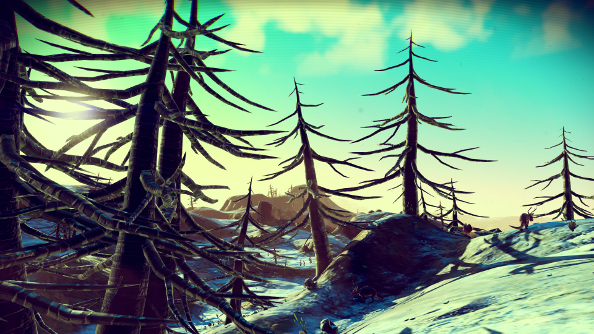 It is peculiar that my initial dissatisfaction with No Man’s Sky spawned from the feeling that it’s missing a lot. Not just the anticipated features that never made it into the game; simply more meaningful interactive possibilities. Certainly, a lot of the things discussed by Sean Murray and the rest of the team during development sound interesting, and I would have loved for them to have made it into the finished product, but that’s no longer the source of my ambivalence. It’s the things they left in. So I find myself imagining another No Man’s Sky. Not the hoped for one with asteroid landings, faction-based battles and players occasionally meeting each other. Instead I dream of a walking simulator in space, where everything is subservient to the relaxed exploration of improbable alien realms. Forget about the dismal combat and the half-baked economic and trading components. It can almost be played like that already. Your focus can be learning alien languages, spelunking, taking screenshots for 70s sci-fi paperback covers, and swimming in the exceptional, synthy soundtrack. It inevitably rubs against the crafting and combat, though. And with it sharing that spotlight, there’s always this sense that exploration isn’t nearly as fleshed out as it could have been. Take the aforementioned alien languages, for example. Your first encounters with intelligent aliens will see you clueless, unable to decipher a single word they throw at you. But over time, you’ll discover individual words and eventually create multiple alien lexicons. The slow drip of language is surprisingly effective at making what are actually largely mundane conversations fascinating. Simply discovering the word they use to refer to you dramatically increases your understanding of a race. Interloper? Friend? How they treat strangers can tell you something about their culture. And after you’ve learned a few, chats become puzzles, as you try to scry context and match the text descriptions and potential answers to the alien words that you know. It’s a shame, then, that interactions with most aliens rarely go further than a brief transaction – buying ships, getting upgrades, donating resources. You’ve collected all this knowledge, scoured the galaxy for new words to add to your dictionary, and your reward is learning that aliens are mostly interested in hawking junk. This lack of follow-through might lie at the heart of the game’s problems. There’s a mountain of big ideas bouncing around in that gargantuan galaxy, but they often fizzle out before going anywhere. The more I write, the more I go back to the game. Sometimes I stop, bored; sometimes I willingly and happily waste time taking pictures of some dumb lizard-dogs and giant plants that sort of look like banana hands. It depends on the planets I discover. 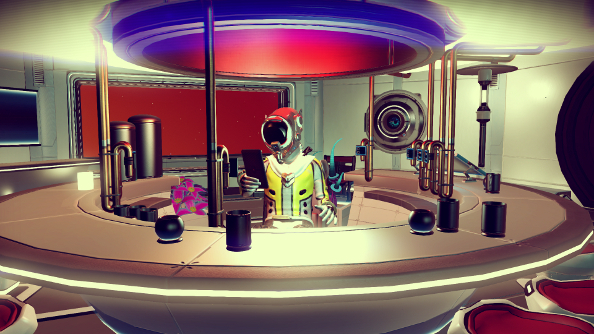 I don’t like to leave my enjoyment of a game up to chance, but I can’t deny that I have found pockets of genuine contentment in No Man’s Sky. It has the power to enchant, and to lull you into sinking hours into another soothing jaunt through space, even though the spell is easily broken by tedious crafting and dogfighting.